Rafah City - Where is Rafah City Located? One of the Villages/Cities of Gaza District, find here important information and profiles from Rafah. Where is Rafah City Located? 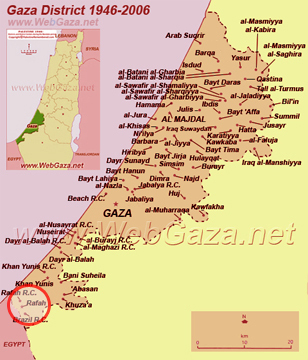 Rafah is located in the southern part of Gaza District, south of Khan Yunis, as shown on the map. The city of Rafah is about 38km south of Gaza City, Together with its camps; Rafah city has a total population of more than 92,000 inhabitants. Rafah has been the border town with Egypt ever since the boundaries were drawn between Egypt and Palestine in 1906.